I was provided with the product at no cost in exchange for my honest Good Cook Nonstick Cutlery Review. For several years we have been using rather cheap knives that just weren’t all that sharp no matter how much we honed and tried to sharpen them. The boyfriend and I both do a lot of cooking from scratch with fresh veggies and meat, so when Good Cook offered to send us a set of nonstick cutlery to review, I couldn’t wait! We’ve been hoping to get a really nice knife set for a while, but if you’re familiar with knives, you know that the really good ones can cost as much as $100+ per knife! Unfortunately spending that much just hasn’t been in our budget with all the other things we have needed to buy and invest in. As a compromise, we bought some carbon steel knives at one of our local warehouse stores. So far they’ve worked wonderfully, but they had a few issues that have made me question their longevity like being super thin and light weight. I have to say that after trying both, I definitely prefer the Good Cook knives. They have just a bit more weight to them that makes them feel more natural to cut with, which makes sense as the knives seem to be a bit thicker than the others we have. However, they’re not as heavy as some traditional knives can be, which I like for extended use. I also like that the handle was made to be more ergonomic, so not only does the weight make it nicer to hold, but the handle is much more comfortable to hold, especially when you have a lot of chopping to do for salads, stir-fry, etc. Plus it’s still easy to hold even when wet. My favorite knife has been the 5″ Nonstick Santoku knife by far (yellow-orange and pictured above). It has a similar shape to the chef knife, but is just slightly smaller, which is perfect for me as I’m only 5’2″ and have smaller hands. I’ve been using it to prepare a variety of recipes like my potato salad and also Spanish rice and a Mexican roast recipes I’ll be posting soon. It’s perfect for cutting so many types of meats, veggies, and everything in between. The boyfriend has been loving the chef’s knife (blue) to carve meats, and I love using the bread knife (yellow) so I don’t squish the fresh homemade bread loaves that I make. I also love that these knives come with covers so you don’t need a block with them nor have to risk your fingers by putting them in a drawer uncovered. They also stick to magnetic knife strips if you rather have them hanging up – and they are so nice looking with beautiful bold colors that you would feel proud to display them in your kitchen, or at least I do! My favorite part is how easy they are to clean since they are nonstick – even if you happen to use one to carve a glazed ham that gets forgotten about for a couple days. Not that I know what that’s like or anything. P.S. – Please remember that even if these don’t look like a traditional real knife they are still VERY sharp and shouldn’t be used by kids without close supervision! Final Takeaway: The Good Cook nonstick knives are my new favorite knife set – especially since the whole set is only around $125! I can totally recommend them to anyone needing a new knife set on a budget. There’s honestly nothing I don’t like about them. Buy It: These knives are available for sale at GoodCook.com for the prices listed above, however through 4/15/13 you can get 30% off these knives – and your entire order – by using GoodCook.com promo code NONSTICK! Win It: Congrats to our winner, Vunda V.! 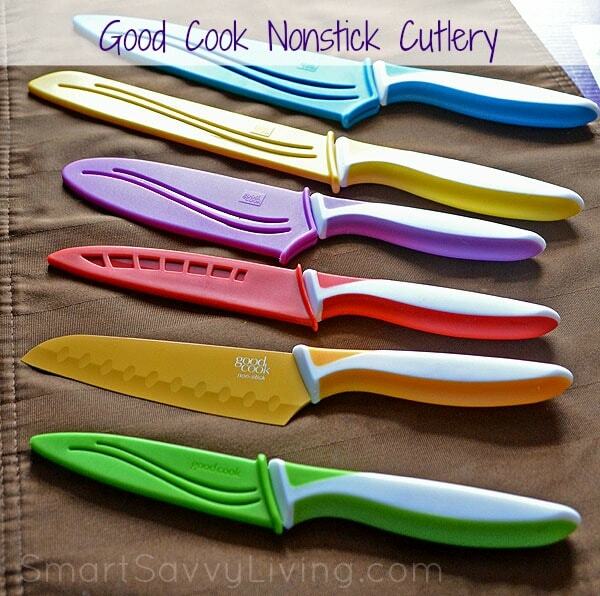 Thanks to the generosity of Good Cook, 1 Smart Savvy Living reader will win their very own set of Good Cook nonstick cutlery worth $125! The giveaway is now over. Disclosure: I received the set of knives pictured above from to improve my slicing and dicing prowess in exchange for an honest review. Good Cook is also the sponsor for the giveaway prize. Smart Savvy Living is not responsible for any shipments, prizes or issues associated with this giveaway prize. 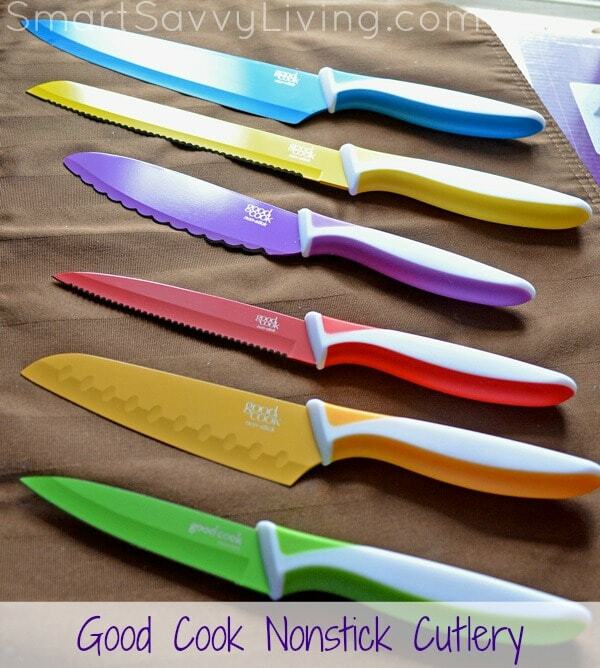 I hope you enjoyed this Good Cook Nonstick Cutlery Review – be sure to check out our other reviews! I don’t have good knives so I’m looking for any right now. I think my favorite will be the bread knife. I feel like I can man-handle a knife through anything, but bread needs the bread knife. I’d like to try the Nonstick Chef Knife with a 5″ blade.